How many arrests have Patrol officers made? Isn't that what's important? Arrests are not the only measure of value for a patrol. Consider the following. No one can prove a negative, the number of crimes deterred. Criminals see the officers in the neighborhood but cannot know the patrol route or how long the officers will be in the vicinity. We are confident that crimes have been prevented by this visible presence of REAL police in our neighborhood. DHP officers have generated arrests, in one case wrestling a thief to the ground. Another officer chased a suspect on foot, and while the man got away, he dropped evidence that the DHP officer collected, and this led to an arrest. Our officers have stopped suspicious people, discovered that they were wanted on outstanding warrants, and taken them into custody, preventing future crimes. 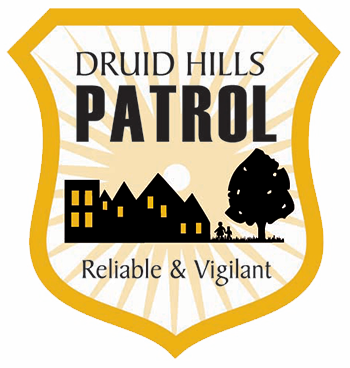 Unlike APD and DKPD beat officers who may be called to 911 calls anywhere in the precinct, i.e., out of the beat area, a DHP officer’s ONLY assignment while on duty is to deter crime in the coverage area and monitor police radio for emergencies IN DRUID HILLS. When they are already patrolling the neighborhood, they usually respond faster than DKPD or APD officers. While our officers are equipped and motivated to spot and arrest criminals, like any other "beat" officers, they primarily serve a deterrence function. DHP officers carry a “rogues gallery” of known criminals in the car, and they stop to evaluate suspicious people and circumstances, intercept solicitors, intervene with mentally ill or impaired individuals, check out homes where alarms are blaring, respond immediately to 911 calls in the DHP catchment area that they hear over police radio, etc. In March 2018 we were able to increase patrol to 8 hours per day, thanks to the support of our members. Due to funding shortages, in the past two years we had only been able to afford to fund 4-5 hours of patrol per day, making the probability very low that DHP officers could arrest a suspect during the commission of a crime. After each shift our officers record brief activity notes, but we have not required them to spend precious time writing detailed reports of each intervention. We understand the value of accountability, but we have asked them to focus their time and energy on policing. Note: Even though they can detain a suspect, DHP officers cannot hold or transport anyone in the DHP vehicle. They must call for an officer from the jurisdiction to come and take custody, and s/he is then credited with the arrest.